Appreciation of a portrait photo greatly depends on a viewer himself. If a lady looks at her own photograph, she seeks some imperfections she thinks she’s got, and estimates, how good a photographer is at concealing them. If you are a photographer looking at an image made by other photographer, you will, consciously or subconsciously inspect it for technical quality, sharpness, lighting, etc. If you are a magazine editor, you will decide whether it fits the format of your project. And so on and so forth. it does not mean that no one will look at a photo as a whole, in fact, everybody will. But still, certain viewers will be more anxious about certain details. So, if you want to make a photo everyone will just adore, it must be good in all aspects. I have to say, it is impossible to do it. Because even if it’s really totally awesome – one or two persons will still hate it, at least because of jealousy. But anyway, you always have your own goals, do you? You can shoot simply for your pleasure, you might shoot a portfolio for a model, an assignment for a fashion magazine and so on. Sometimes you are responsible for everything, sometimes you just “press that button” while casting, styling and post-production are done by other members of your team. Sometimes you just look at a photo and fall in love. Sometimes you think “fine” and in 2 seconds switch to some other photo. This is what makes a difference. Yes, portrait photography is about revealing the nature and character of a person, you’d say, and it is photographer’s talent which makes every person beautiful. But at times you just can’t build a healthy connection with a model, which can turn your shoot into disaster. Sometimes you don’t choose much here. But if you are going totally creative, you need to be extremely selective in choosing a person you will take pictures of. If a person is awesome-looking, it doesn’t guarantee that one will behave naturally in front of a photo camera. Maybe they’ll stand in one pose for half an hour with a fake smile, and you will not be able to do anything about it. Being able to make a connection with a model is one of the photogapher’s most important skills, but sometimes you just never know until you try. You may imagine exclusive clothes and tons of accessories here – well, not necessarily. A generic white t-shirt and jeans is also “style”. The main thing here is to keep things in harmony, and avoid using some really inappropriate combinations and excessive elements. This is where less is more, really. Try to think in “concepts” – for example, you want a photo of a woman that represents the idea of “lightness and tenderness”. Try to include everything in the style and setting, which gives the sense of “tenderness”, and avoid anything that will not invest in this concept (unless you want to play with contrasts). Generally, it is best to hire a professional stylist and make-up artist, if you have a budget for it. Even if it is a non-commercial shoot – unfortunately, in most cases, if you want a really good photo, you must invest a dollar or two, be it a pizza to cheer the model up or a team of stylists. Or, look for emerging professionals who will be willing to work on time-for-print basis. It can be plain simple, it can be extremely complex. Light and style go side by side – soft or harsh, high key, low key, whatever. You have to be creative here – but at the same time, this is where you must know the rules and understand plain technical stuff. It’s fine as long as it’s not disturbing, I’d say. I believe there can be no perfect composition for a specific setting – there are always tons of variants, and too many of them will look splendidly. But sometimes you look at a photograph and think – something is just not right. Human body is a very delicate subject to handle, so pay attention to everything – eyes, lips, shoulders, arms, legs. Keep an eye on the background as well – do not forget that even though it is separated from the subject, they together make a single 2d image, where they come together. Appropriate setting contributes to the overall style and even makes you feel “inside” the photograph. Do not underestimate it’s value, since it can draw even more attention, than a model you are shooting. Try to include some “typical” stuff in the frame – something, that will tell a story. Being not too obvious here is a true talent. Being one of the main ways of communication for people, this aspect is infinitely important. This is where small changes make big difference. 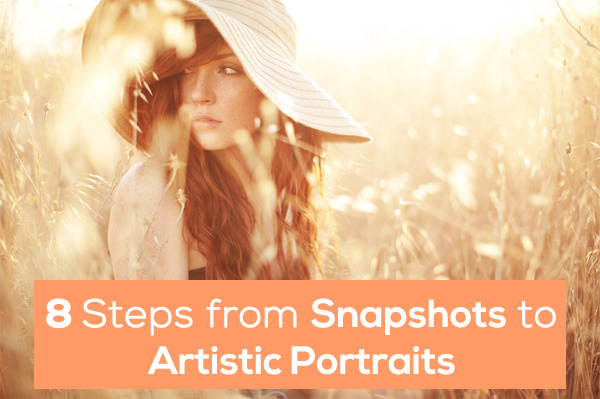 Fake emotions are very easy to read, and authentic ones are not so easy to capture – this is when you have to look back to part 1 of this post, and consider once again, if your model is artistic enough. Static portraits are just fine, but having some sort of movement in a still image is magic. It can be in model’s pose, emotions, waves of clothing, falling snowflakes. It when you stare at a picture and just wait and wait for it to start moving. To be sure that your tones are okay, you can put you photos side-by-side with some sample photos by recognized photographers. People also like to devastate the face skin texture with plug-ins, or extreme blurring techniques, to, once again “look professional”. But hey, take a closer look at commercial portraits – in most cases, the skin texture is still there, though brought to a perfect condition. Still, photography is not math, and you can not invent a formula for a perfect photograph. But remember – small details are a big deal!